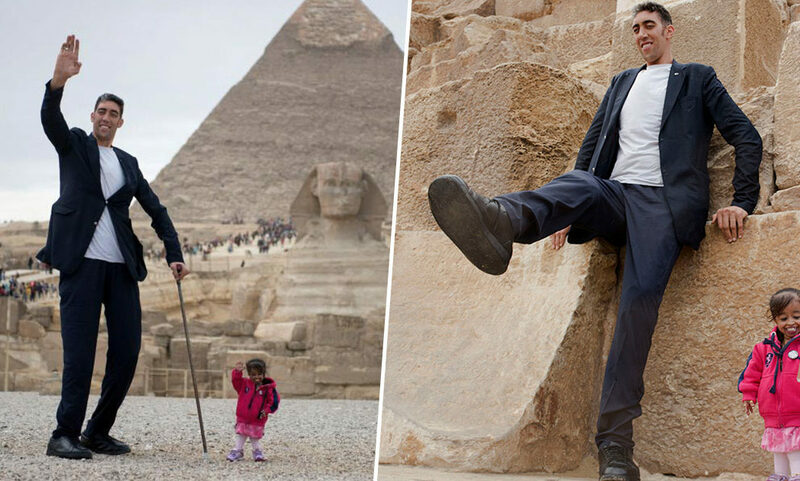 The world’s tallest man and the world’s shortest woman have met up and had a photoshoot in Egypt producing the best pictures you will see all year! According to the Guinness World Records, Sultan Kosen, from Turkey, is officially the tallest man on Earth standing at a height of eight feet one inch. Meanwhile by contrast Jyoti Amge, from India, holds the record for world’s shortest woman being just over two feet tall. Invited by the Egyptian Tourism Promotion Board, the pair have posed in front of the world famous Giza Pyramids in Cairo in the most amazing photoshoot ever. It is the start of a tour the two world record holders are taking which will see them visit Cairo’s most popular tourism sites and talk at a conference which is being held in the Fairmont Nile City Hotel in the city. Both Amge and Kosen won their records back in 2011 which are still unbeaten. In 2014 Kösen met the world’s shortest living man at the time, Chandra Bahadur Dangi, at an event in London to celebrate Guinness World Records Day. Dangi, from Nepal, measured the same size as six stacked cans of baked beans standing at one foot seven inches tall. I love London and to be able to finally meet Chandra after all this time is amazing. Even though he is short and I am tall, we have had similar struggles throughout our lives and when I look into Chandra’s eyes, I can see he’s a good man. It’s been a lifelong dream to travel and becoming a Guinness World Records title holder has enabled me to do that. I’m honoured to be in London, I’ve always wanted to visit and the fact I get to meet Sultan is special. It makes me extremely proud to represent Nepal all around the world, I’m extremely humbled by the support I receive. Amge was born in Nagpur, Maharashtra in 1993 and was given the record just after her 18th birthday in 2011. She currently works as an actress starring in American Horror Story and co-hosted a show called Lo Show Dei Record in 2012. Her height is a result of a form of dwarfism known as achondroplasia.